2POUR® is a simple, well-designed accessory for the Aeropress® coffee maker that allows you to make two cups of 8oz coffee from just one single plunge. Born from a desire to create beautiful, functional products the new 2POUR® has been carefully designed to further enhance your Aeropress® brewing experience. Reusable. We believe in buying once, buying better. That doesn’t mean it has to be expensive either; we are committed to ensuring everything we design is made to last and at an affordable cost for all. The 2POUR® has been designed to last a long time – meaning you’ll only ever have to buy one, that is, unless you’re buying one for a friend too. Washable. We designed the 2POUR® not only for a great coffee brewing experience but we also made it super easy to clean. The product is a single-unit design with no removable parts, resulting in a quick and easy cleaning experience with most household cleaning cloths. Easy to use. The Aeropress® is one of the easiest products we’ve ever used to make coffee and the 2POUR® is no different. 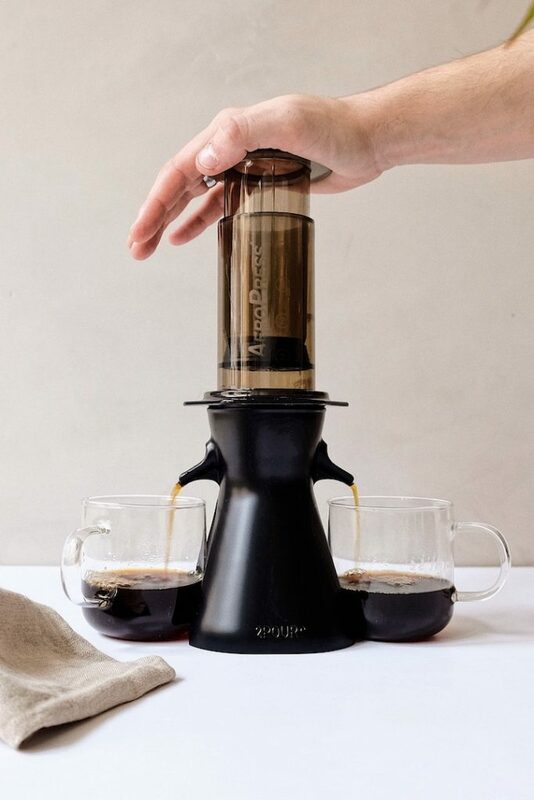 It was really important for us to design the 2POUR® so that when combined with the Aeropress® it has little to no impact on the original brewing experience; meaning, ‘less fussing, more sipping! – but this time, with friends!